When making healthcare decisions, what you don’t do may be more important that what you do. Over diagnosis and over treatment can be a danger in our age of sophisticated technology and current medical model. But several research studies have shown that mortality rates of some diseases are not changing despite high rates of diagnosis and aggressive treatment. In some cases, it’s better to take a mindful “wait and watch” mindset, as opposed to making a quick fear based decision about your body and health. Mammogram screening guidelines will advise women who fall into a “high risk” category to return every 3-6 months for repeat mammograms for years and years, re-introducing radiation exposure and tissue trauma to an already risky situation! In addition, biopsy is often quickly recommended over one concerning mammogram, which could be a false positive. 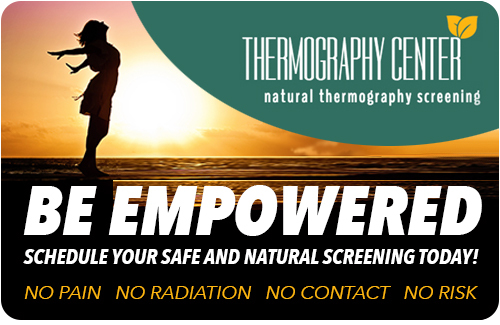 Thermography, on the other hand, is a no-radiation breast screening approach for women seeking mammogram alternative. The practice and philosophy of thermography encourages patients to choose each step needed carefully and wisely. Careful and cautious monitoring and follow-up screenings of whatever is most appropriate, along with correlation screenings for breast concerns is always advised and encouraged. Thermography can be used as to take images of the head to see if there are any indications of physiologic changes around sites of dental work such as the presence of infection and problems with crowns, root canals, and mercury fillings. If the images reveal sites of inflammation, thermography can then be used to either monitor the ongoing condition of a developing problem, monitor how well a treatment is working, and/or help design and carry out a prudent plan of action for ameliorating the cause of the problem. For example, instead of deciding that all of one’s silver fillings need to be immediately removed and replaced, taking thermographic images can assist with proceeding in a more cautious manner. A no radiation screening option approach might include having a heavy metals test or CRP inflammation blood test done first. By utilizing the additional thermographic information that dental x-rays alone cannot provide, the patient becomes more educated and empowered to make better healthcare decision along with their practitioner. Informed follow-up on a diagnosis or recommendation is an essential part of maintaining good health and wellness. Thermography can be part of an action plan that helps one choose tests that make the most sense for each unique situation without introducing any additional risk.